This is part four of “Films of 1949” series (Part 1, 2 and 3). The Ikedas lost all the glitters and glamor they once had. A decade ago, they were the respectable clan of respectable society. The end of the war brought them a period of humiliation, disgrace and loss, enormous loss. The head of the family was thrown into jail, their properties were liquidated and prospect of regaining the past glory is dim. Their beautiful daughter, Kyoko, whom her parents and grandparents had envisioned bright future, and possibly a marriage with a handsome young man from a family of at least their caliber or preferably much more distinguished, is now dating some fellow from streets (Keizo). Then, this uneducated man surprised them with an unexpected gift; a piano. They lost their piano when they had to raise money, and since then, it had become the unhealed scar among them, especially to Kyoko. It must have been a symbol of Kyoko’s unadulterated childhood, of better days with echoes of Chopin, Mozart or Beethoven ringing in their faded memory. When a piano is delivered unannounced, Kyoko is visibly bewildered. It is not a bewilderment of pleasure. It’s a scar wide open. “Here’s to the Girls (Ojo-san Kanpai)” is probably the most charming statement on division, deconstruction and infusion of class hierarchy in postwar era. Keisuke Kinoshita deals this subject with just a right amount of humor and sincerity, otherwise it would have been too somber a subject. Keizo is not molded into a stereotypical money-monger and Shuji Sano splendidly crafted a character of an independent entrepreneur with good intentions. Kyoko is a sensitive, yet battling woman of noble bleed, well-played by Setsuko Hara. A piano was one of the focal points of their relationship. In Japanese cinema of 30s and 40s, piano was inherently linked to women of the upper class. The instrument had become the symbol of luxury, especially for a heroin whose life had tuned sour after the war. Through this instrument she would express her emotions, battered feelings or complex anguish. In “No Regrets for Our Youth“, Yukie (played by Setsuko Hara three years earlier), almost violently exerts all the musical power of a poor instrument, as if to curse the world beyond her safe haven. Apparently, Kurosawa found an effective vehicle for cinematic narrative. Piano, by its nature, is a fixture in a house. It is not mobile, as violins or guitars, nor cheap. Furthermore, Japanese-style house was not ready to accommodate such a totally foreign object (,yet). Playing the piano on chair was not a part of life on tatami. In prewar era, it leads to the image of piano in a Western style house (only affordable to rich one percenters), with a drawing room full of sofas and couches (only affordable to rich people with nothing to do). After the war, rich families of conglomerates and royal heritage were stripped of privilege, and money flowed into new class of riches, of black-market, of trading or of people who were keen on changing tides. Change in social class structure made this immoblie object quite cumbersome presence. This image was reflected in many of postwar cinema. Some, as in No Regrets, completely abandoned the instrument to meet new society, while others tried to redefine it in a new environment. Funakoshi, a head of the powerful, influential family, invites Tajima (Masayuki Mori) to meet his daughter, who, Funakoshi claims, is madly in love with him. Tajima, a Casanova with cheap moral, already had severed ties with all his girl friends (ten of them!) for this occasion, expecting marriage with this unknown but promising rich girl with huge fortune. To convince his former girl friends to give him up, he had asked his black-marketeer, Kinuko, a beautiful woman but with vulgar speech with no manners, to masquerade as his wife. It worked nicely, and he is convinced he is on the way to the Society (though he started to feel funny about this cute black-marketeer). Now, to his astonishment, Funakoshi’s daughter, Kinoko, is the dead-linger to this black-marketeer, in a beautiful white dress, playing the piano. As sleazy as ever, he pretends to know the piece she is playing, “Ah, I love Chopin”, to which Kinuko replies with dreamy eyes, “I love listening to this Beethoven’s Moonlight Sonata, under moonlight.” Then, she switches to Jazz, smiling to completely dumb-folded Tajima. This lightweight Japanese version of screwball comedy, “Good Bye”(1), is full of amusing antics of battle of sexes between Mori and Takamine with delightful result. Here, piano is the instrument to arm Kinuko/Kinuyo’s (Yes, they are the same, after all) against Tajima’s womanizing. Masquerade between Kinuko, a rich society girl, and Kinuyo, a black- marketeer, is amply suggested by switch between Moonlight Sonata and Jazz (in some sense, Kinuko/Kinuyo is cinematic predecessor to Eliza in Cukor’s “My Fair Lady”). Both in “Here’s to the Girls” and “Good Bye”, men are completely ignorant of western classical music. (In “Here’s to the Girls”, Kyoko plays Chopin while Keizo asks if it is Beethoven.) Though this ignorance is for comical effect , it evolves into the vital plot element at the end of “Here’s to Girls”. I wonder if the audience at the time knew Beethoven’s Moonlight Sonata or Chopin’s Fantasie-Impromptu. It is more likely that majority of audience identified with Keizo’s bewilderment or Tajima’s pretense. 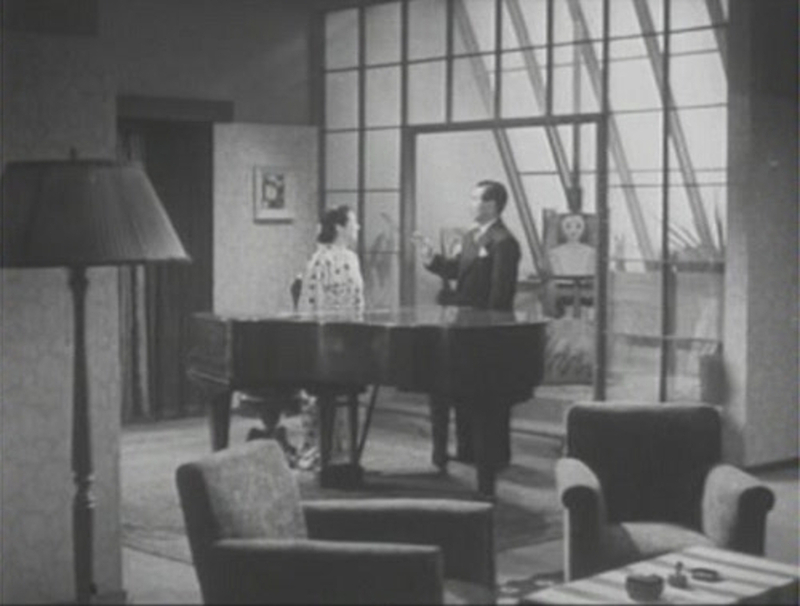 Piano plays various key roles in other films of 1949. In “Ginaza Kankan Girl”(Takamine’s next film), Oharu, played by Shizuko Kasagi, “Jangle Boogie” girl, dreams about playing the piano which she used to have (presumably before the war). Kurosawa’s “Stray Dog” brings us to suburban idyll scented with piano study. In “Yabure Daiko”, another screwball comedy (somehow reminds me of My Man Godfrey) directed by Kinoshita, a spoiled son (played by Kinoshita’s brother and composer, Tadashi Kinoshita) sings a silly song about tyrannical father, self-made business man (Tsumasaburo Bando). The song is about a blown drum, allegory to their father losing grips in the society. It is a revolt against father-centric family; another ignorant man, trying to imitate other rich families, bought a piano as an ornament to his house. Now it is playing a song condemning his Hitler-like behavior. Piano is now transforming itself from a fixture in an affluent household to an instrument of liberation. In forties and fifties, (Western) music industry in Japan was still in its infancy, though population of musically inclined steadily increased. To answer demands from the domestic market, Yamaha ramped up mass production of piano in those years, under tight quality control. This modus operandi brought amazingly uniform set of products, devoid of rich color or tone, especially suited for population of the uninitiated. In 2009, sixty years later, the penetration of the instrument into Japanese household was around 25% (2). You can find Yamaha Music School or any other music schools for extracurricular studies in any neighborhood. Some kids practicing Mozart or Ghibli song on the piano used to be a staple of suburban noise-scape. The instrument did in fact liberated Western music to larger population and many of us today wholeheartedly smile at Tajima’s ignorance. (1) The film is based on the unfinished novel by Osamu Dazai. The half of the film was written by Hideo Oguni for the film. Also, the original title of the film was “How to handle women”.